In the chronicles of history, mankind and garments have had an extensive, storied and intertwined relationship; clothes started as a tool to stave away the cold and to survive our unforgiving environments via covering ourselves in fur or animal hide. It was, simply put, a very basic need. Ultimately however, through the many years and decades, clothing became more than just a mere survival tool and became a way to display prestige, influence, and to symbolize style and sentiments, among other abstract human thoughts and principles. In today's modern age, people want to feel amazing and confident through what they wear and one of the best ways to do that is through shopping with us! 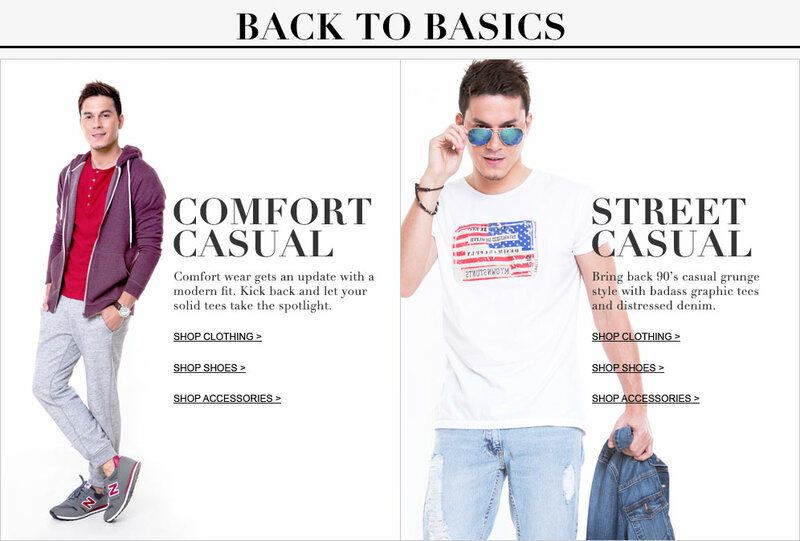 Express yourself and level up your fashion intellect with apparel that is flexible, versatile but ultimately posh and trendy with Zalora Men's Basics! In the market for some simple but chic and savvy apparel that is perfect for everyday use? Want something that is durable, flexible, versatile --- not to mention keep you looking cool around your friends? The best one stop online fashion shop in the country showcases a comprehensive selection of topnotch clothing basics from the very finest global and local brands and designers, so it will definitely suit the needs of people with different tastes and predilections, aside from satiating your need for both a comfortable style and a street casual style. Whether just hanging out with the guy at a bar or club, off to a quaint little stroll or jog at the park on a lovely Sunday morning, having a relaxing moment at a great coffee shop, we will surely have something you can wear! Keep things uber chic and urban savvy as your exhibit your own remarkable sense of flair with basic apparel that is sure to charm. Have all these great items items delivered to you at a click of a button and in the convenience of your own home in Zalora Philippines the best online shop around!